Bougainville, situated at the northern end of the Solomon Islands, is the largest island in the chain, and in 1945 was part of the Australian mandated territory of New Guinea. It is 190 kilometres in length and 60 kilometres at its widest, and in March 1942 was occupied by the Japanese. On Bougainville, the Japanese established a series of bases and airfields as defensive outposts for the large and heavily-defended Japanese naval base at Rabaul, on the nearby island of New Britain. The most significant of these was located at Buin, on the southernmost tip of the island, which was occupied by the Japanese 17th Army. The US Marines landed on Bougainville at the beginning of November 1943 as part of an overall strategy that had been developed to isolate Rabaul. The strategy of "island hopping" was thus evolved, in which strongly defended Japanese positions were bypassed and isolated by establishing Allied airfields and bases to provide the cruicial air and sea support that was needed to cut off the enemy at bases such as Rabaul. 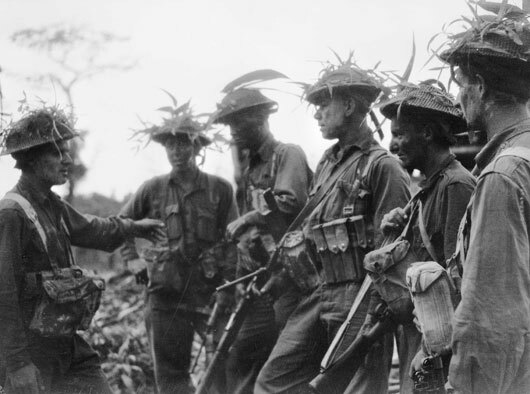 In late 1944, the Australians replaced American troops on Bougainville and after initially advancing into the interior of the island, the 3rd Australian Division moved south along the coast from Empress Augusta Bay and then south east along the Buin Road. Here they encountered bitter fighting at Slater's Knoll, which lasted from 19 March until 5 April. 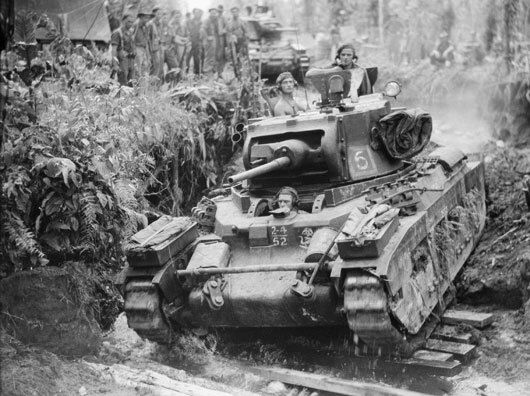 Meanwhile the 11th Infantry Brigade continued to advance towards the north of Bougainville until the end of January when the Japanese launched a heavy counter-attack near the Genga River. It took hard fighting, with artillery support, to break the Japanese. The Australians then pushed on and by the end of April had secured the Soraken Peninsula, hemming the Japanese into a small area on the northern tip of the island. Australian casualties sustained in fighting at Bougainville, which continued until the end of the war, amounted to 2,088, with 516 killed and 1,572 wounded. 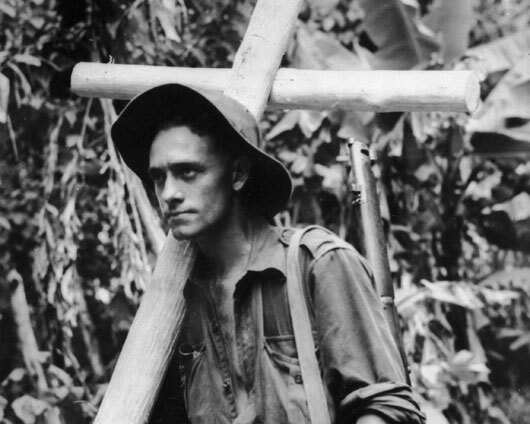 An Australian infantryman carries a cross hewn from rough forest timber to a forward position to mark the burial place of a fallen comrade (AWM 018176). 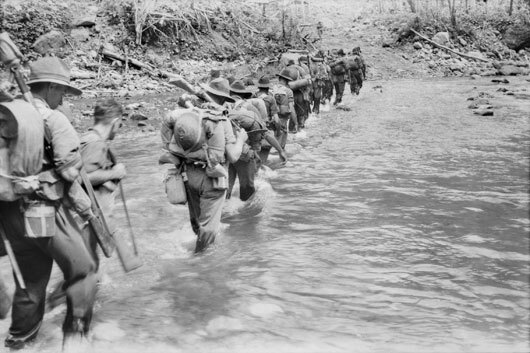 Troops of the 9th Infantry Battalion cross the Laruma River as they move forward to take over positions occupied by American soldiers (AWM 077250). Troops of the 25th Infantry Battalion receiving last minute instructions before an attack on Japanese positions on Pearl Ridge (AWM 077894). 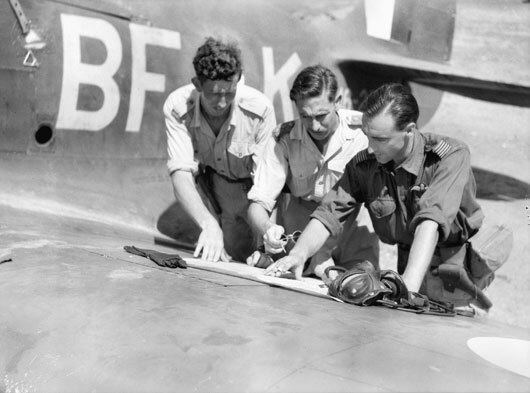 Captain John Excell of Sydney breifing pilot officers prior to a a combined air strike with the Royal New Zealand Air Force against enemy targets in the area (AWM 078318). 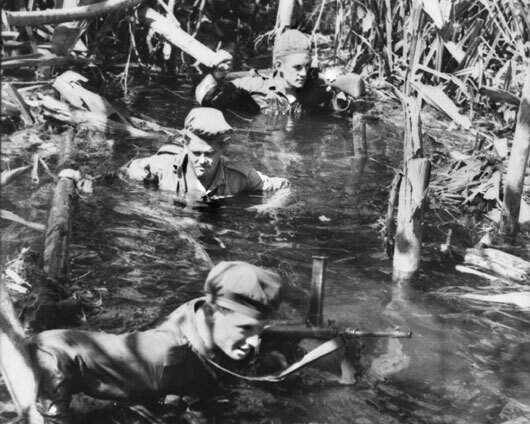 Members of a contact patrol negotiate a section of swamp during a patrol towards enemy territory (AWM 078546). 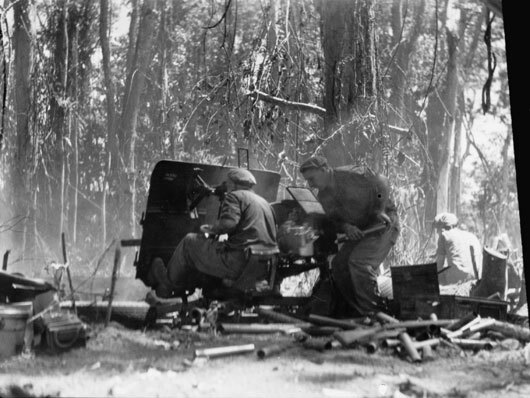 25th Battalion troops firing shells from Slater's Knoll during action against the Japanese (AWM 090347). Armoured Regiment Matilda tanks crossing the Sindou River on the Buin Road in support of troops of the 24th Infantry Battalion (AWM 091229). 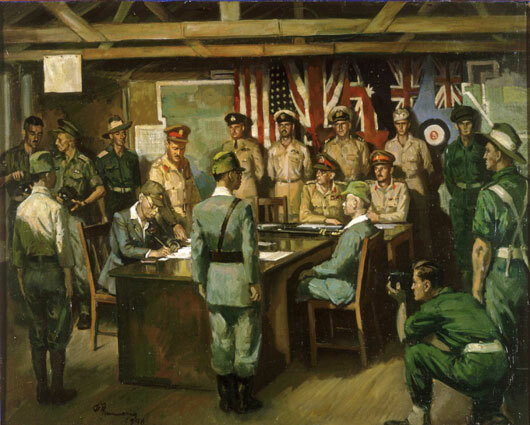 Geoffrey Mainwaring, "Surrender ceremony, Bougainville, 8 September 1945" (AWM ART26675).